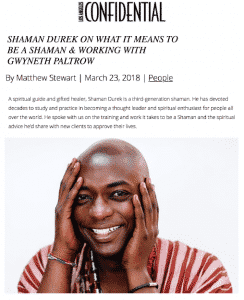 Shaman Durek is a third-generation shaman. He has devoted decades to study and practice in becoming a thought leader and spiritual enthusiast for people all over the world. He spoke with us on the training and work it takes to be a Shaman and the spiritual advice he’d share with new clients to approve their lives. What does it mean to be a Shaman? SHAMAN DUREK: To be a shaman is to be willing to sacrifice your life for the evolution of our species and the sustainability of life by helping people understand who they are without false pretenses, labels, and belief systems that are not grounded in unconditional love. You are an ambassador of the spirit world to the physical world. Helping people to understand the unknown and the deeper meanings of life in a simplistic, digestible, intellectual way. Is there specific training that you went through to achieve this position? SD: Yes, there is a specific training. It starts when you’re young, around 11. You learn about everything from how the human consciousness operates, energy dynamics, the principles of sociology, anatomy, physiology, trans-communication, healing, focus, and discipline, and so much more. It’s ongoing until you take your rights of passage. But you are still learning even after that because you are in a human body. It’s humbling and rewarding to be of service to humankind. I function on the principles that we are all in this together and I share what I can to put the power back in people’s hands. As a third generation medicine man, what were your impressions of medicine men as a child and young man? SD: I was curious, I was captivated by it but also just wanted to be a kid and having spirits and all kinds of things happening to me made me feel like something wasn’t right. I noticed there were differences between my world and other people’s worlds. For instance, my friends are on the football team having their own life and I’m learning how to let spirits into my body and conjure things from different dimensions and reading people’s energies. On one hand, I felt very excited and empowered about what I could do with my abilities and on the other hand, I felt like I was being used and robbed of my childhood. How did you connect with Gwyneth Paltrow and how do you work together to improve her work and personal life? SD: She sought me out via recommendation and we spent the day together, and the rest is history. I share with her shamanism and my gifts and it strengthens her clarity and insight to empower her to see her highest truth. Share some of the elements taking place at the Well Being in the Modern Age event you are participating in this Saturday. SD: I’m going to be speaking on a panel with Natalie Kuhn, Julie Piatt, Neuro Hacker Collective, and Allison Charles. It will be moderated by Luke Story. I’m excited to hear the topics Luke will bring to us that will enlighten and create a conversation of intellect and change. What is one piece of spiritual advice you share with new clients to improve their lives? SD: There are so many things I share but one of the things I share the most is that you don’t owe anyone anything. Do it because your heart wants to do it, not because someone told you-you have to. There’s no one that is like you in this world so there’s no one who can judge you, which makes you instrumentally valuable. Therefore, you must shine brighter than the sun without fear or hesitation.